We have polluted our planet Earth with light. Light pollution - excessive and obtrusive artificial light, with bright neon and LED lights in our cities and in our personal space, continuously illuminated and artificial - has removed something incredibly valuable from our lives, and at the same time affected our ability to sleep, rest, and relax. 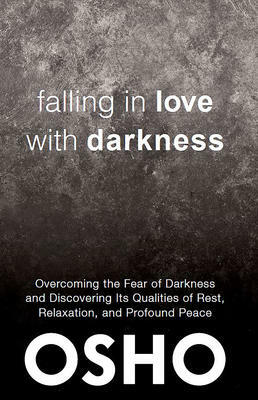 'Falling in Love with Darkness' is Osho's attempt to bring us again in contact with darkness, but here in a spiritual and psychological context. Why do we desire light?," he asks. "Why do we hanker so much for light? Perhaps we never realize that the desire for light is a symbol of the fear rooted within us; it is a symbol of fear. We want light so that we can become free of that fear." The mind is afraid in the dark. The fear of darkness is based on the fear of being alone: the fear of being alone comes together with the fear of darkness. Darkness has its own bliss; without falling in love with darkness, you will be deprived of the capacity to love the great truths of life. Next time you find yourself in darkness, take a direct look into it and you will discover that it is not so frightening after all. When darkness surrounds you, become absorbed in it, become one with it. And you will find that darkness offers you something that light can never give you. All the important mysteries of life are hidden in darkness. These are talks by Osho given at a meditation camp where he introduces people in a direct and practical way to an understanding of meditation as a way to get acquainted with darkness, to re-discover that darkness is peace, relaxation, and stillness, all through the simple method of witnessing. "Meditation means: discovering the one who is beyond all happening and has never been a part of anything.""